This is a nice heavy duty 500lb deer cart to haul out your large game, or in a Doomsday survival scenario, it can be converted to carry your Bug Out Bags and more supplies. This cart saves the pain and strain of trying to drag trophy game out of the woods or to carry heavy gear. Why make hauling heavy game out of the woods harder or hiking with heavy backpacks harder than it has to be when you have too much stuff to carry. With its large wheels and heavy frame, this cart is really suited to save your back in the wilderness and allow you to carry more survival stuff. 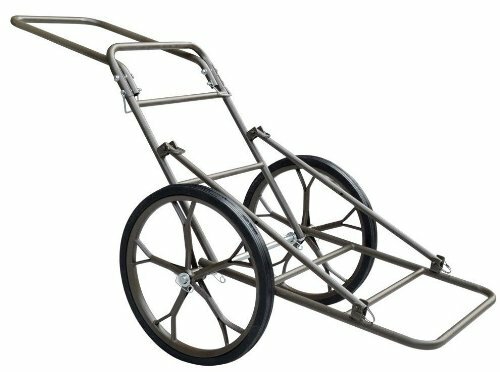 This particular model 500lb Deer Cart Game Hauler is heavy duty and is unique in that it assembles and disassembles easily and quickly with quick clip pins (no tools are required). The offset handle makes maneuvering this cart easier, and it has removable rubber wheels for folding and transport. Consider adding a piece of plywood to the bottom using conduit straps). Also, you can buy and attach a gun rack across the top (or fabricate rifle holders by using handlebar mounts or by attaching simple rubber coated hooks on the frame - see recommended accessories below). Then purchase some straps, tie-downs or bungee cords to secure your gear and you've got a Bug Out hauler that can easily carry a lot more gear than without it. You'll be able to travel much further, save your back, and even roll easily over obstacles. "This cart is a tank. I bought some gun rack mounts and use this to haul my ammo boxes and guns to the range. I can push or pull easily. I have used it to haul over 500# in ammo and it moved well." "Worked great. Also added plywood to bottom and bicycle kickstands up front to keep level and use to carry ice chest and fishing gear, when having to hike in." "I use this cart to haul fencing supplies, t-posts, 2 7/8 pipe, etc. and an air compressor over rough terrain. It works great. Very easy to disassemble and reassemble with the clip pins. I made a 5/8 inch plywood base for it to make it easier to haul things." "Very sturdy and fast to put together"
"A little heavy but a great price.."